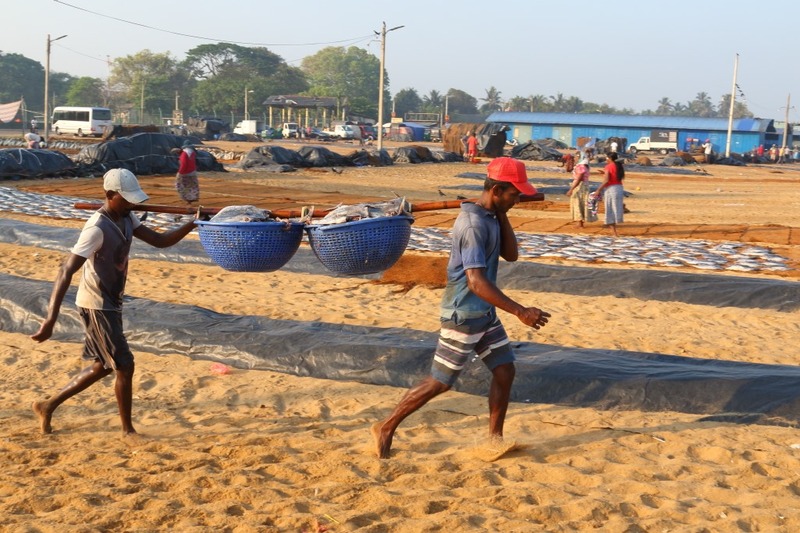 This was our first full day in Sri Lanka and we were up early to get to the local fish market at Negombo before hoards of other tourists arrived. We tipped out of our bus to get an hours worth of very fishy smells up our nostrils. Most of what was going on consisted of pairs of men carrying two baskets loaded with fish strung on poles. 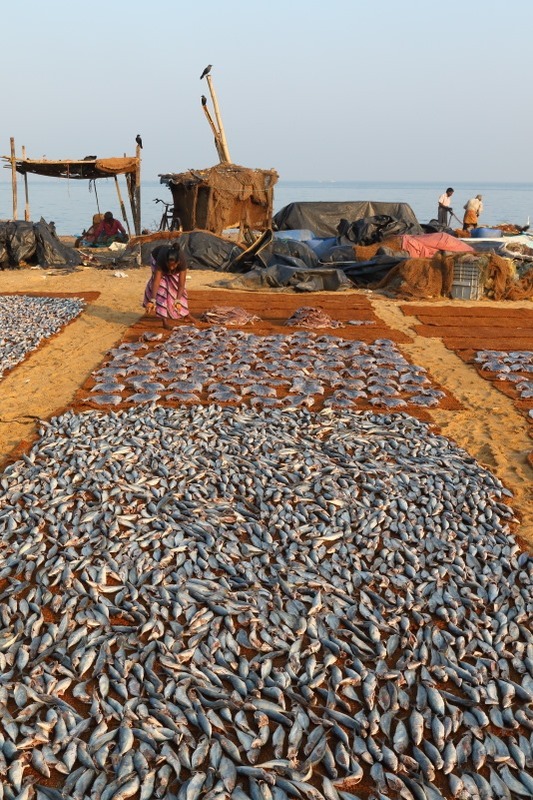 They deposited the fish onto mats spread over the sand where their womenfolk set about spreading them out. This was a drying process. Eventually an older gentleman explained in reasonable English that the fish had been strongly salted and that this is why the ever present birds were not bothersome trying to nick the catch. He also said he’d been on a TV programme with Rick, though he’d forgotten the last name – Stein, of course. The drying process took three days, he said. Taking pictures here was all well and good but tended to result in the subjects asking for money. No wonder I rarely take photographs of people. After returning to our Negombo Hotel for breakfast we hit the road bound for Wilpattu National Park where we’d be staying for two nights mainly in search of a Leopard. Wilpattu should be a highlight for me. In February 2017 we’d made a trip around Namibia where Etosha should’ve been my highlight but it was someway through that itinerary and I’d managed to succumb to a stomach bug from breakfast at the previous night’s lodge. Wilpattu being at the beginning of this trip, I was hopeful of avoiding any repeat performance. As our transport was leaving town, we came across a business firing roofing tiles. 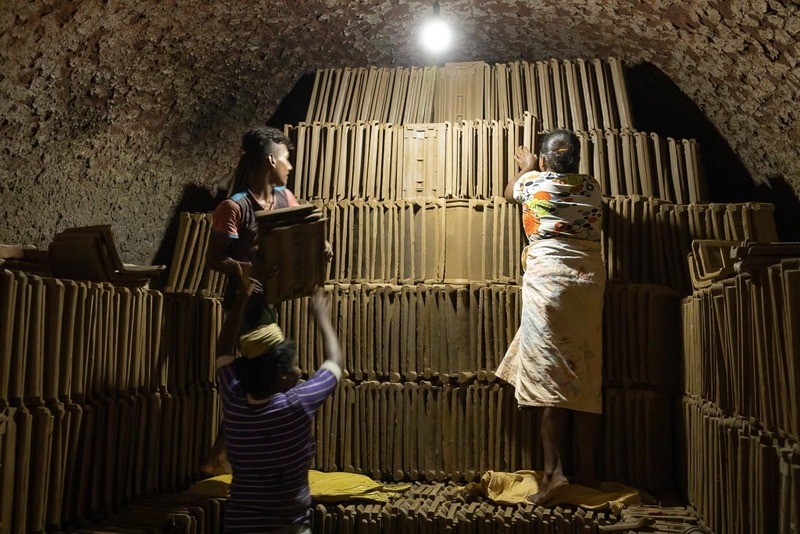 Ladies were carrying tiles into a vast kiln where they were being stacked. 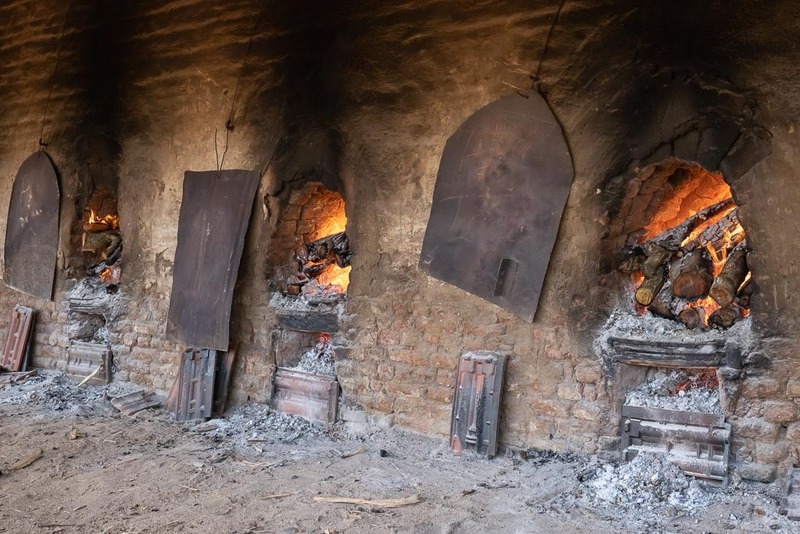 A similar large kiln room on the opposite side of the building was already being heated by large wood fires looking more like pizza ovens. Our bus pulled in so we could get a closer look. Continuing the journey, it was refreshing to get our first glimpse of Sri Lanka’s countryside rather than a city. We made our way to a lakeside restaurant at Kurunegala for a comfort break and a coffee. Lotus flowers were growing in the lake margins and a man was harvesting them. Yay, habitat! Personally, I was much less interested in a coffee than I was in the possibility of my first encounter with some Sri Lankan dragonflies. I was not disappointed. My first customer was a new species for me: Blue Pursuer (Potamarcha congener). Two others that looked familiar also proved to be new species so I was off to a decent start. We continued to the first of our Buddhist temples. I suppose it’s inevitable that we’d get Buddha’d out on such a trip. Frankly I’d rather have stayed at the lake playing with the dragonflies but I went along not knowing where we were going afterwards … and to show willing. Now, we’ve done [plenty of] Buddhist temples before and are familiar with the ol’ take-your-shoes-off-before-entering routine. It’s done at the door, right? Well, no, not in Sri Lanka apparently. Here, at Ridi Viharaya temple (Silver Temple) the shoe rack was at least 200m away from the temple itself. We’re talking 30+°C here meaning that we had to walk across baking hot concrete paving stones covered in dark berries and assorted other detritus, much of which was sharp underfoot. 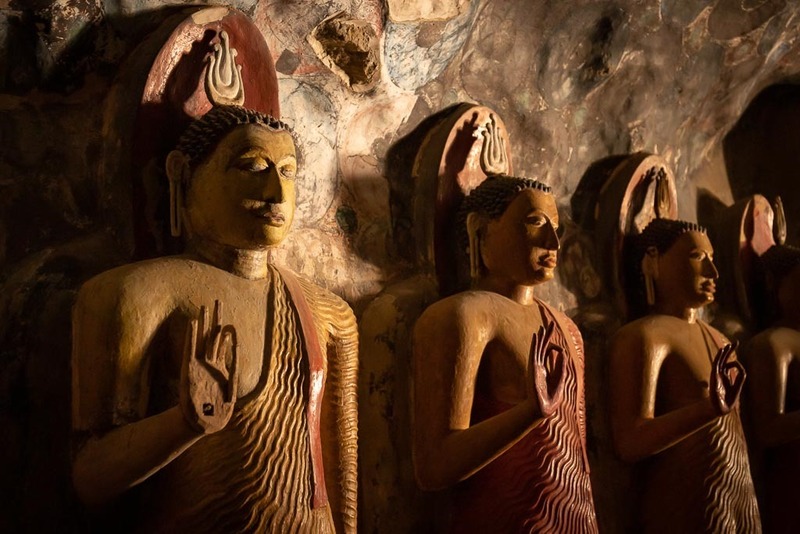 As a wrinkle that was new to me, Buddha was not only barefoot but didn’t wear a hat, so neither could I wear a hat. With the soles of my bare feet getting burned and pricked as well as stained with black berries, and my head getting frazzled in between the scant patches of shade, I gritted my teeth, persevered and got half way before thinking “sod this” and returning to the shoe rack equally uncomfortably. You are permitted to wear socks if you don’t mind ruining them. While a more determined Francine captured the requisite array of Buddhas, I redonned my shoes and hat – I ain’t risking skin cancer on my unprotected head for any religion – so I could go and play with butterflies on a patch of grass outside. 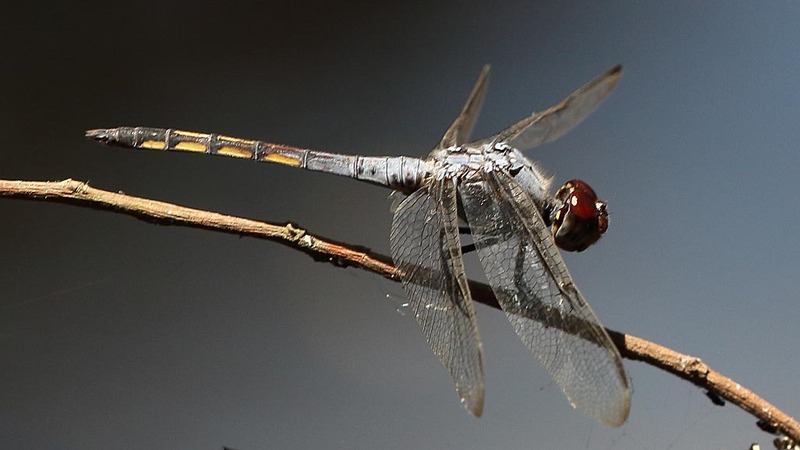 Unexpectedly since water was not apparent, I found a dragonfly, too. Francine returned quite promptly but some others took what seemed like hours. Eventually, however, they were rounded up and we returned to the lake for a late lunch. Darn, I could’ve stayed playing with the dragonflies instead of killing the soles of my feet after all. 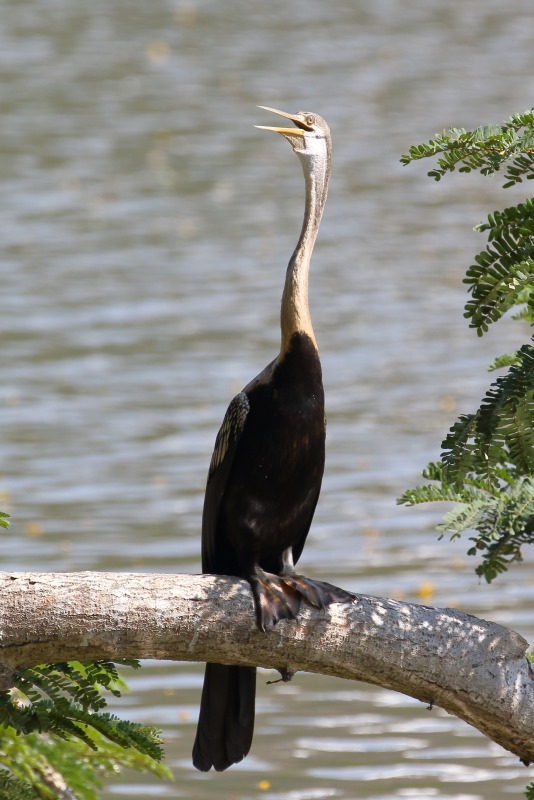 Never mind, I got another chance now and there was a cooperative Indian Darter (Anhinga melanogaster), known colloquially as a snakebird because of its snake-like neck, posing on a branch just in front of the restaurant. The temple had caused a bit of a delay so when we did finally arrive at our accommodation just outside the Wilpattu NP boundary we were running a little late and darkness would soon be falling. Religion should come with a health warning. If one has to cut ones feet to shreds and die of skin cancer, there’d better bloody well be an afterlife.